How to be you, Liza? It is a fangirl's ultimate dream to meet her fave idols. And to have them follow your social media accounts? #Goals! Of course, this is all nearly impossible EXCEPT if you're Liza Soberano. With her gorgeous face and pleasing personality, it is no shocker that she's made connections with a lot of famous international celebs who've visited the Philippines. 1. Charlie Puth personally invited Liza to his Manila concert. However, Liza wasn't able to attend the concert of the "See You Again" singer because of prior commitments. Still, getting a personal invite from an international performer is a total WIN! 2. 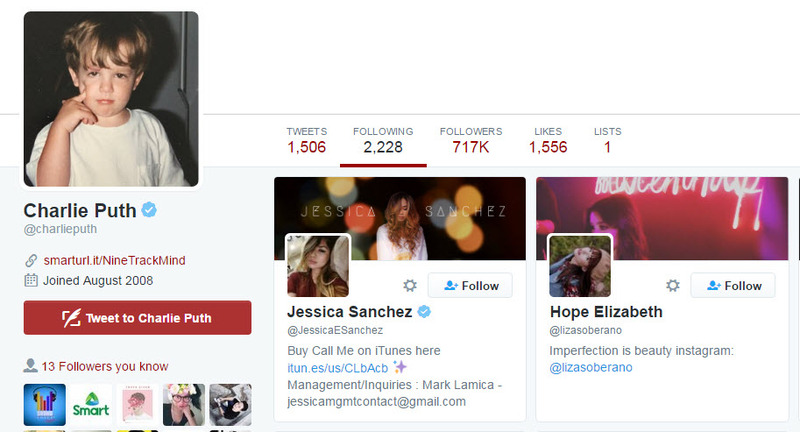 Even if she wasn't able to watch Charlie's show, he still followed her on Twitter! He even addressed his apparent "attraction" to Liza in a video taken during his concert on Sunday night at the Kia Theater. #GOALS! 3. #TB to the time Justin Bieber followed her FIRST on Twitter! 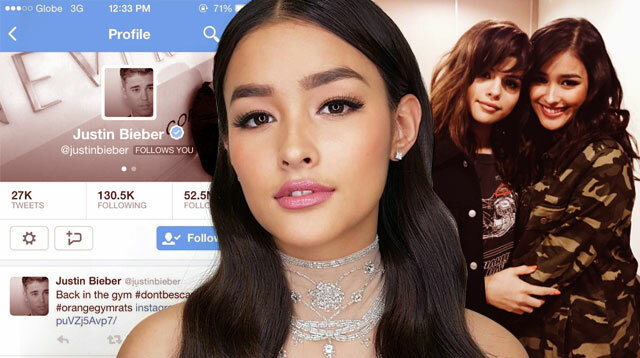 Back in 2014, Liza couldn't help but feel excited when the Canadian pop star followed her on Twitter! the Biebs, however, eventually unfollowed her, though. But hey, not everyone can say Justin Bieber followed their Twitter account! 4. Insta-Likes for when she met up with Selena Gomez! The "Kill 'Em With Kindness" singer was in Manila for her Revival Tour that happened at the SM Mall of Asia Arena on July 31, 2016. Liza was able to meet the American popstar backstage before the concert started. She posted their photo on Instagram and wrote: "I'm in love with @selenagomez She's such a beautiful person inside and out. It makes me so happy when I idolize the right person"
5. And this groupfie with Ariana Grande! Liza went with Enrique Gil to watch Ariana Grande's concert on August 23, 2015. The LizQuen love team also had a meet-and-greet session with the "Into You" singer along with The Voice Kids PH Season 1 runner-up Darren Espanto. 6. Catching The Vamps perform in the PH twice. The Kapamilya actress was lucky enough to meet the band members backstage both times! The first time Liza personally met The Vamps—composed of Brad Simpson, James Daniel McVey, Connor Samuel John Ball, and Tristan Oliver Vance Evans—was back in February 2015 for their solo concert at the SM Mall of Asia Arena. The British band returned in January 2016 and the Dolce Amore star had another chance to meet the boys. 7. Taking this selfie with James Mcvey! It's safe to assume that the British band member was smitten by Liza's beauty as he uploaded their photo on his personal Instagram account. James wrote, "You were so lovely @Lizasoberano." 8. A selfie that happend not just once but TWICE! Of course, when The Vamps came back, James uploaded a new selfie with Liza. For this Instagram post, James wrote: "Lovely to see the wonderful @lizasoberano tonight. I did sing to her... Maybe"
9. Basically, every member of The Vamps followed her on Instagram. 10. And lastly, Fifth Harmony's Camila Cabello followed her back on Twitter! Dear Liza, how to be you po?